On last week’s episode of real housewives the ladies discussed the Porsha vs. Kenya aftermath. Momma Joyce joined the women to reflect on the drama from this season and where she stood with her opinion of Kandi and Todd’s relationship. Cynthia and NeNe also hashed out their issues from this season, which lead to an unexpected outcome. Did you watch last week’s episode? If you missed it we have a full and detailed recap, right here for you. On tonight’s episode Apollo joins the women to address rumors about him and Phaedra and his alleged run in with the law. 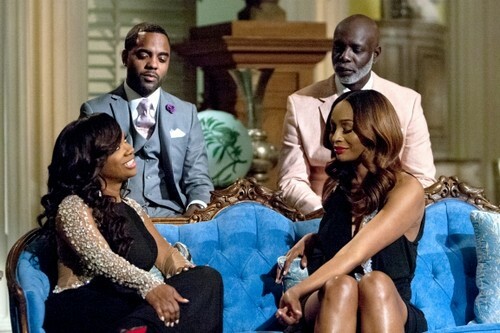 NeNe and Kenya go head-to-head in a battle of the titans, plus, the rest of the husbands join the mix to offer their thoughts on all of the ups and downs of this season. Tonight is going to be another great episode of RHOA for sure and you’re not going to want to miss a minute. Tune in at 8Pm EST on Bravo and we’ll be recapping it live right here for you but in the meantime, hit up the comments and let us know your thoughts on all of the drama that has unfolded so far this season! Part III of the reunion opens up with the Marlo situation. Marlo used to be a close friend of Nene’s then she started hanging out with Kenya and that’s when all the drama ensued. Nene hadn’t liked the fact that Marlo was hanging out with her sometime other friend and so she issued an ultimatum. She told Marlo that she couldn’t be friends with the both of them and when Marlo ignored her; she was tossed aside. And Marlo was pretty hurt by that. Nene was more than just a friend of hers. Kenya hadn’t liked the way Marlo was treated and neither had Cynthia. It was a pretty juvenile move that no one appreciates. Although Nene doesn’t see it like that. In her mind, she tried to help Marlo out and Marlo was the one that threw away their friendship when she chose not to listen to Nene’s “advice”. But Cynthia is used to Nene’s logic. She says that Nene likes to do these types of things to people and yet hates when a simiar or the same thing is done to her. Kandi can understand that. Nene used Kandi’s mom as an example of a low class brawler and Kandi wasn’t pleased by that. Yet Nene is sticking to her guns and refusing to apologize. A policy she’s adopted that no one cares for. Nene can come across as arrogant and downright rude when there’s no reason for her to act that way. She portrayed that behavior at Kenya’s charity event. Like the time she said that no one there was on her level. Never mind that her supposed best friend, Cynthia, was also there. Or the fact that she made a fool of herself in front of a charity. Even then she only sort of apologizes to the charity she once was a great patron of. Though she did at least help at one other charity. She dared Kenya into matching her donation to whatever charity Kenya chose. Nene did this to embarrass Kenya by bringing her finances into it, but if Kenya does match her 20k then one lucky charity would have won 40k in total. Phaedra was finding all of this hilarious. The back and forth fighting between Kenya and Nene was amusing. However when the spotlight was on her; she again was evasive with the truth. Phaedra claims that she was raised to keep things in her marriage between her and her husband. So Andy naturally asked her why she was on the show to begin with. Because there really isn’t a worst place to hide marital discord than on national TV. Well as for the discord, Phaedra and Apollo deny having that. They’re saying that they’re tighter than ever (with little to no mention as to what will happen in his court case). And then Apollo went on to say more than he should (like he always does). Apollo told Kenya that she should be thanking him. After all he was the one that built her career and that’s why he asked her to send him his due (money). As for Kenya, she ignored him. Kenya kept on trying to ignore both Phaedra and Apollo. Which Nene thought was a bit two-faced seeing as when she tried to do the same thing earlier with the Marlo topic Kenya had called her out on it. Nene, Phaedra, and Apollo all don’t like Kenya so they’re all sitting on their side of the couch throwing shade to the other side. While Cynthia and Kandi for the most part are being neutral. Kandi did say that maybe Kenya should have thought things through, but Kenya stopped her. She said there was never problem between them and she didn’t want there to be. Which Nene translated as Kenya wanting to get in between Phaedra and Kandi’s friendship. Like that could ever happen! When the husbands did come out it started as a stand-off between Peter and everyone else. Most of the women said he was overreaching when he got involved in Women’s business. And Peter felt that he’s always been opinionated. There’s never been a time when he hasn’t said anything so why the backlash now. There doesn’t seem to be a problem with him and Nene still. Both the husbands are truly more concerned about Cynthia and Nene’s relationship. The women at one point would speak to each other every day and Peter for one thinks their broken friendship should be fixed. Afterwards the arguments between the cast began to circle the same drain – like with Nene’s party. None of the guys thought Christopher was out of line. They swear they would have done something if they thought he had grabbed Kenya aggressively and Kenya continues to say that no man should have grabbed her without her permission. She also says that her friend, Brandon, was the only real man in the room because he told Christopher not to grab her. And Brandon turned out to be a sore subject all on his own. Apollo claimed he apologized to the other man and Kenya said he didn’t. Nene also called Brandon a Queen several times very derogatively. Fans didn’t like that and Andy also admitted to being personally offended. So Nene apologized. But this extra hour of Part III isn’t doing anyone a favor. It’s basically Kenya and Nene fighting and when they’re not at it – Andy is desperately trying to bringing other people to the forefront. All of this makes them look ugly and then when some of the women have something snide to say before signing off of what’s probably the most charged season of the series – it leave people like me to beg the question of “where’s their class?”. None of them were able to walk away without getting caught playing in the dirt and frankly they all looked like they needed break from the show and each other. The only person to like after this is Andy himself!